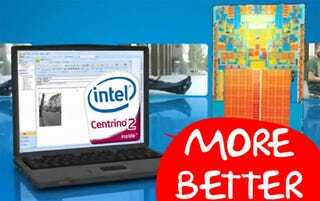 Intel's Centrino 2 notebook platform officially launched yesterday, and brought an armada of new laptops with it. Centrino (2) is actually just a brand name for a mobile platform, which is really a fancy way saying a combination of Intel parts: a processor, chipset and wireless module. The latest and greatest is Montevina, which is not only energy efficient, but more powerful than the previous set, Santa Rosa. It also makes wireless N standard, puts WiMax in its future, and has graphics that can switch between integrated and discrete for battery/performance needs. In short, this year's crop of notebooks will blow last year's away. Here's some more in-depth goods on what Montevina offers. The processor soul is the 45nm Penryn-while last year it mainly offered a battery boost, thanks to Montevina's faster 1066 front-side bus, you'll see some real performance gains this time around. (Intel says up to 50 percent). In that same vein, not only are Intel's integrated graphics faster with the new GMA 4500MHD, it'll let you switch between integrated and discrete graphics (like a card from ATI or Nvidia) on the fly, so you can pick performance when you need it and save juice when you don't. Sony and Lenovo are the first to have notebooks with this tech. On the wireless front, it makes wireless N standard with its new WiFi Link 5000 modules. WiMax is optional, and you'll see that in Centrino 2 notebooks later this year. Finally, it (and Penryn) are totally engineered to simply sip power, like an anorexic model with a venti skim half-decaf no-whip mocha (really, check out Lenovo's X200's retardedly awesome battery life). That's Centrino, in a nutshell. Bottom line, it's gonna be the best year ever to buy a notebook. Something we missed, or you still wanna know? Send any questions about Centrinos, chips, Pringles or anything else to tips@gizmodo.com, with "Giz Explains" in the subject line.